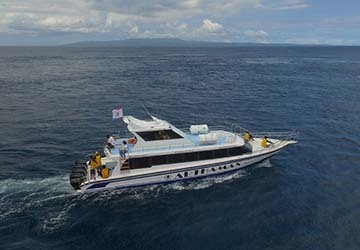 Bali has become one of the most popular holiday destinations in the world, especially with young travellers and backpackers, and Arthamas Express have taken advantage of the demand by supplying a very quick and convenient sailing across the Badung Strait, carrying passengers between Sanur and Lembongan. Four engines boasting 250 horse power give credence to the name ‘Fast Boat’ which is the vessel used to carry the travellers on their route. The crossing departs three times per day from both locations, with the ship possessing a length of 16.25 metres and width of 3.50 metres that is capable of transporting 80 passengers at a time. The boat is equipped with a wide range of safety equipment, including life jackets for each passenger, four ring buoys and diligent staff who are fully trained. The views on board make the half hour crossing run seamlessly; spectacular vistas of the surrounding landscape make the sailing even more enjoyable – especially when the refreshing sea air keeps you cool as you admire the breathtaking views. Once landed, there is a free transfer to nearby hotels, as well as a complimentary pick-up system from your resort to the port itself. Use directferries.co.uk to find Arthamas Express timetables, prices and to book Arthamas Express ferry tickets. Looking for the lowest fares for your destination? Don’t worry, we’ll also compare Arthamas Express with alternative ferry companies.